A (hilarious) statue in Sugar Land, Texas has triggered backlash and anger among residents. One of 10 statues planned depicting local life, this one features two young women leaning in for a selfie in front of City Hall. The statue's portrayal of a pretty standard millennial activity has many up in arms because it lionizes narcissism, and has the potential to look dated in the not-to-distant future. Other criticisms are being lobbed because it portends the apocalypse, is "stupid," "hurts my soul," and is proof that "our country has gone to hell." While residents are losing their minds, many are mistakenly frustrated at the city for using tax dollars to erect this statue. It was actually purchased by the Sugar Land Legacy Foundation, who paid for the 10 statues as a part of a beautification project. The project was approved two years ago by two citizen committees and the city council (haters should have gone Leslie Knope on it then). The other nine statues aren't quite as amusing, but follow suit on a theme. "The donated statues are intended to depict activities common in the plaza and parks where they are installed," Doug Adolph, a city spokesman, told ABC. While it may not signal the end times, the selfie statue does seem to have an oddly short shelf life. Other statues feature timeless activities like sitting on benches and playing acoustic guitar where no one wants to hear it. The selfie statues feels a bit akin to memorializing a kid playing "Sonic the Hedgehog" on a Game Gear in 1992. 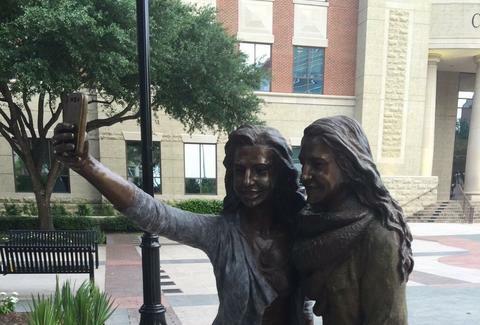 While there was plenty of outrage about the state of humanity and generations of "stupider and stupider" people, just as many residents of Sugar Land either like it or have had a good enough sense of humor to take a selfie with the statue. At least they aren't using a selfie stick, right? Dustin Nelson is a News Writer with Thrillist. He wonders what tapas are like in Texas, where everything is bigger. Follow him @dlukenelson.